A circular walk from Horton in Ribblesdale in the Yorkshire Dales. The walk heads out along Horton Scar Lane and on to reach Hull Pot, which could well be the largest natural hole in the UK. The path then heads on towards Selside, with views of the Yorkshire 3 Peaks (Pen-y-ghent, Whernside and Ingleborough) along the way. Through Selside, the path starts its return journey via Alum Pot. Alum Pot is almost 350 feet deep and is joined to other pots / caves by an intricate cave system. The walk then returns to Horton via Sulber Nick. Turn right out of the car park onto the road towards the Pen-y-ghent Café. After about one hundred yards, cross the road following the sign for "Bridleway Foxup 5½ miles, Pen-y-ghent 3¾ miles". A track leaves the main road opposite the sign heading away from the café - this is Horton Scar Lane. A wooden gate is soon passed through just to the right of a metal gate, and the walled lane is followed straight ahead, ignoring the lane that goes off to the right. This walled rough lane is then followed for a further 1½ miles until a wooden gate is reached and the path passes out onto Horton Moor and becomes grassy underfoot. Whilst progressing up the lane, there are some fantastic views ahead of Pen-y-ghent looming large in the distance. On passing through the wooden gate, the path splits - take the path straight ahead walking directly away from the gate, rather than more major path to the right, which heads up Pen-y-ghent. The path to be used is signed "Bridleway Foxup 4 miles". The path ahead now continues keeping about thirty yards to the left of the wall. After a few hundred yards, Hull Pot is reached, where off to the right there is a stile over the wall. Care must be taken walking towards Hull Pot if the visibility is bad, because there are steep unfenced drops around all sides. Hull Pot could well be the largest natural hole in the UK, being about two hundred feet long, sixty feet wide and sixty feet deep. Hull Pot was formed when a cave roof collapsed. Continue on in the same direction past Hull Pot, by the initially dry riverbed, which a little further on turns in to Hull Pot Beck. Water only flows over this riverbed after periods of heavy rain, and generally the beck just sinks underground a few yards before the pot, to come into view again as a waterfall below in the pot itself. This water then disappears again only to re-emerge this time at Brants Gill Head. Follow the path alongside the beck then through some small ruins for a further hundred yards or so until another stile is reached over the wall to the right. Do not climb over the stile, but turn left, crossing the beck following the path which heads directly away from the wall. On passing over the first horizon, the path is clearly visible ahead winding its way to the next visible horizon. The path meanders heading away from Pen-y-ghent, at times in large loops to avoid the boggier sections. After a flatter spell the path then descends down towards a wall, and is visible beyond it. The path passes through a gap in the wall and immediately passes through Black Dub Moss Bog. Through the bog, the path climbs away from the wall. The path then descends to a very boggy section where a short detour over to the right is advisable before swinging back around to the left to rejoin the path. This area here is known as Red Moss Bog. The path undulates to false horizons before dropping down again to another wall. Again go through the gap in the wall and continue on the far side. The path then continues on over the next summit before dropping more steeply towards the next wall. 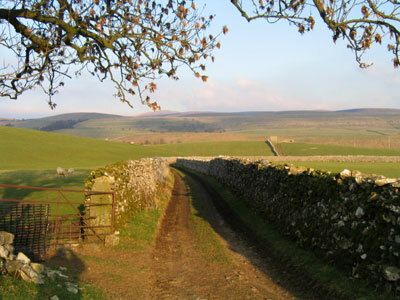 Over the wall, the path heading in the same direction can be seen heading towards the woods in the distance, over which can be seen Whernside. On reaching the wall go through the gap in the broken down wall, over the small stream and continue on in the same direction. Over the next horizon, head down towards the junction of the walls. As the wall is neared, ignore the gate that the path initially appears to head for, and go over the stone stile built into the wall just to the right of it. Go over this and continue ahead uphill to the right of the wall. Over the next horizon, drop down to yet another wall, pass through the gap in it and continue ahead where the path leaves the wall and becomes a much wider grassy path. After about four hundred yards the grassy path is joined from the right by a track heading towards Whernside. The track drops down to a wall. Here go through a gap in the wall to the left of the gate, and continue along the track just on the inside of the wall. The track bends around to the left and meets another track by a large stone. Turn left here and start to head slowly down hill down the wide track. There is a footpath off to the right to Nether Lodge, but ignore this. As the track makes its way around a farm building, the track becomes metalled underfoot. After a further twenty yards go right by a metal gate over a stone stile following a footpath sign for Selside. Follow the path diagonally right for about thirty yards heading for the centre of the small wooded area ahead and pass over a wooden stile. Go through the trees for about fifteen yards to pass over a second wooden stile, then continue on down and across the field following the path in the line of the two stiles just crossed heading for the wooden stile in the fence about fifty yards to the right of where the telegraph wires go over the wall. Over this stile, continue to head down to the wall by the water (Coppy Gill). The path continues by the side of the wall as it heads towards Low Birkwith Farm. Go through the metal gate by the large tree and keep to the right hand side of the wall. Coppy Gill is now directly to the right of the path. Follow the wall around for about twenty yards into the cobbled courtyard. Once in this courtyard, there is a track that goes off to the right immediately crossing the gill that is signed Nether Lodge - ignore this. Continue straight ahead for the gap in the wall. Just to the right of the gap in the wall, where the gate is, there is a sign for "Selside 1 mile" - follow this sign. Go straight ahead passing through a gate and then keep to the right hand side of the field by the barbed wire fence. After a further fifty yards pass through a further metal gate between a fence by the water and a wall. Keeping tight by the water, continue on over a small wooden gate built into the wall on a stone stile, then continue on and pass through a gap in the next wall a few yards in from the water. After thirty yards, go over the wooden footbridge, followed by a second wooden footbridge a few yards further on. Immediately on passing through the gate at the end of the footbridge follow the footpath sign for "Selside ½ mile" and keep straight ahead in the field skirting around the edge of the fencing on the left to the corner of the field. In the corner of the field, go over the stone stile into a ten yard wide walled alleyway, and proceed a further thirty yards to the footpath sign ahead. Turn right here along the walled lane following the Selside 1/3 mile sign. After a short while take the left hand fork continuing up the hill (not into the farm) and then pass through the bridge under the Settle to Carlisle railway line to pass out onto the B6479 Horton to Ribblehead Road in Selside. Turn right here and proceed along the road for about two hundred yards and turn left down a rough lane heading towards Alum Pot. Do not turn right - ignore the lane off to the right over the cattle grid and the footpath sign. If you wish to visit Alum Pot, there is a sign on the left that informs you that it is on private land and a small charge needs to be paid a few yards away at Selside farm. Continue along this rough lane heading away from Selside. A couple of hundred yards further the walled track bends sharply around to the left, which will eventually be followed, but first a short diversion can be made to Alum Pot. Go over the stone stile on the right hand side of the wooden gate on the bend and follow the track up hill for about five hundred yards to a small walled and fenced off area containing some trees. There is a stile to get into the small wooded area in which is Alum Pot. Care must be taken around here, as there are many unguarded severe drops. Just past Alum Pot, continuing on in the same direction, within the next five hundred yards lie Diccan Pot, Long Churn Cave and Upper Long Churn Cave. Alum Pot itself is almost 350 feet deep, and all these caves are joined in an intricate cave system. Return back down the path to the wooden gate and pass back out into the walled lane. Turn right along the walled track, and follow the lane for a few hundred yards until a wooden gate is reached. Go over the stile in the wall to the left of the gate, and continue ahead through the field keeping on the path initially tight in by the wall. Where the wall bends to the right, leave it and head diagonally left across the field heading for a wooden stile next to a wooden gate. Then continue on in the same direction across the next field as the path appears to head towards Borrins Farm. Just before reaching the farm, go over the stile by the gate in the wall ahead, with Borrins a hundred yards or so to the left. Continue ahead now by the side of the wall and through the metal gate and along the wide track which heads directly away from Borrins. There is an Ingleborough Nature Reserve sign here. Continue on this wide track which is marked along the way by small way markers. The track becomes more grassy underfoot and walking becomes much easier. Part way up the hill to the first horizon, a more minor path goes off to the right, ignore this and continue ahead. Over to the right is Ingleborough, whilst over to the left is Pen-y-ghent. After about half a mile, the track flattens and passes through the stile by the gate in the wall ahead. Continuing on the path bends around to the right and flattens out in front of a rocky outcrop where there is a four way footpath sign. Turn left at the signpost following the sign for "Horton-In-Ribblesdale 1½ miles". The sign also states that: right is Ingleborough 2 3/4 miles; back is Selside 1 3/4 miles and to the straight on is Clapham 3¾ miles. Go straight on and the path, very eroded in sections, follows a series of spaced out cairns as it makes its slow descent through Sulber Nick, all the while with Pen-y-ghent directly ahead. After a while the path splits, again momentarily to go around a large indentation in the ground, before shortly afterwards passing through a little nick to a double wooden stile a few yards further ahead. Pass over either of the stiles and follow the path away from the wall heading for a cairn about seventy yards ahead. Once past the cairn drop down a wide path to the signpost a further fifty yards ahead and follow the sign for Horton-In-Ribblesdale continuing on in the same direction to pass through a hole in the wall about fifty yards further on. Once through the hole in the wall the path swings around to the right just past the wooden way marker. These short wooden way markers, often with a green band around the top, mark the path for about the next third of a mile as the path winds its way back down through the limestone. The path swings around just in front of a short wooden 18-inch high fence with a yellow arrow on it pointing to the right, before winding its way through the limestone pavement. After a couple of hundred yards, the path swings around to the right just after a small cairn and just before it reaches a wall a further twenty yards ahead. The path passes another way marker before dropping down past an information plaque describing the area on Ingleborough, and then on over a wooden stile a further five yards distant. Once over the stile, the path ahead now can be seen almost all the way back to Horton-In-Ribblesdale. The path undulates, but all the while slowly descending for the next five hundred yards until it reaches the next stile. Go over this stile and drop down approximately thirty yards to reach and then pass over a farm track, before rising over the next hill in front, passing underneath the electricity wires above, and then on to the wooden gate in the wall a little further on across the field. Pass through the wooden gate and drop down about thirty yards down towards the station below. To enter the station, pass through the wooden kissing gate and climb down the few steps to enter out onto the platform. Cross the railway line as instructed, taking care to ensure there are no trains on the track and leave through the gate marked exit out onto the metalled road. Walk down hill away from the station to join the B6479 Horton to Ribblehead road and continue straight ahead in the same direction, heading back for the centre of Horton-In-Ribblesdale. After a further one hundred yards, and just before reaching the small humped back bridge in front of the Crown Hotel, turn right following the brown tourist information centre sign to cross the river Ribble by way of a wooden footbridge. Once over the footbridge, follow the path the final few yards back into the car park.